Transfer to the airport takes approx 10-15 minutes. The hotel leisure club has a gym and swimming pool. Conveniently located just minutes from Heathrow Airport, this hotel has indoor heated swimming pool & Jacuzzi and a Fitness centre with cardio-vascular equipment, sauna and solarium. All rooms have private bathroom, climate control, phone, modem point and internet connection, satellite TV with pay movies, fridge, safe, Tea/Coffee & mineral water, trouser press, iron & hairdryer. Parking is usually on-site at hotel but your car may be taken to a secured site nearby at the hotel's discretion. If you book the room only package, overnight parking is charged at the standard rate. There is no free overnight parking. The Pulse Café.Bar.Deli Opens from 05:00 to 03:00, Bravo! Bravo! Restaurant open for dinner: 17.30 - 22:30 - RGB Grill & Bar and The Lounge (and 24 hour room service) - Night club: 22 - 3 am. guests have complimentary access to the fitness centre which comprises of wide variety cardio-vascular equipment, 15x7m heated pool, Sauna, Jacuzzi and Solarium at a charge. Opens from 06:30 to 20:30 Mon - Fri & from 08:00 to 18:00 Sat - Sun. Bravo! Bravo! Restaurant - the all-inclusive entertainment venue where you relax with a drink or cocktail. Then enjoy a classic movie from around the world world with a choice of either a full à la carte or buffet meal. Soft music plays until 10pm & then it gets livelier with dancing until late. Just one of the many Hotels near Heathrow Airport available from FHR. A comfortable hotel with parking on site. It is easy to get to and the main parking area is around the rear of the hotel. Check in was quick and the staff friendly and helpful. You keep your car keys with you. If you need a transfer to the airport terminal then Hoppa Buses operate and you can buy tickets in the hotel reception. There is a large restaurant and bar which is quite busy but, the service was fine for us. Expect to pay high prices for food and drink. You are a captive audience and there is nowhere else to go for food and drink in the locale. The room was clean and fulfilled our needs for an overnight stay. Hotel was very nice. Room comfortable but could hear the lifts during the night. Hoppa to the airport was good, however Hoppa from airport was dreadful. Must have only had 1 bus doing the circuit. Waited over 50mins for one to turn up and by then scores of people were piled on and some left behind. Difficult to actually get parked at the hotel. Hotel was fine, simple but clean, smooth check in and easy to get the hotel hoppa bus. Hotel room comfortable and quiet. However the car parking was interesting. We found a spot to park in when we arrived although feel it was more through luck than judgement. When we returned, granted it was Easter Sunday, the car park was bedlam with cars on double yellow lines, double parked etc. It was so tight we struggled a little to get our car out. Recommended. Parked my car at the hotel before my holiday - parking was directly in front of the hotel, check in was swift and the Hotel Hoppa was a quick transfer. On my return I stayed at the Park Inn - again, check in was swift, I was given a choice of rooms and the accommodation was clean and quiet, all you want after a long flight. No complaints. On arrival,could not park,but reception arranged to be shown to an available specs. Perfect and we kept the keys. We were upgraded to a room on the ground floor as my husband struggles walking,again perfect. Evening meal and breakfast was enjoyable and we requested a taxi to terminal 4 ,which was arranged. 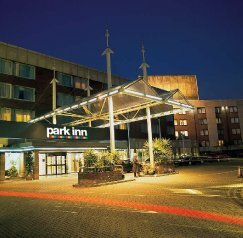 When we next travel from Heathrow,we will use Park inn. The hotel was fab the only problem we had was that they had not received our booking from yourselves. Luckily they were able to find us a room but I don't know what we would have done if they were fully booked and it was New Years Eve so would have been very stressful. The hotel itself was fine and along with the parking, worked very well. HOWEVER, we paid for a return Hotel Hoppa bus trip to get us to Heathrow and then back again. The pick up and travel to Heathrow was fine, but on returning to Heathrow and trying to get back to the Park Inn Heathrow, the bus transfer was a nightmare. We read the timetable board which confirmed that bus H3 would take us to Park Inn. We waited 30 minutes and then an H3 bus arrived. We got on, showed our tickets and sat down. We were then told that the bus would not take us to Park Inn. When I said that the sign said it was the right bus, the young lad who was chatting to the driver, said no they wouldn't be going there and to get off and wait for the H1. 15 minutes later, an H1 arrived and we were told no, we would need to get an H3! One hour later, another H3 arrived with a courteous driver who said yes, it was the right bus. Goodness knows why the other H3 wouldn't take us, but it left us very tired and angry. Otherwise, hotel was perfect for what we needed. Clean and comfortable friendly staff. Excellent, hotel clean and comfortable. Concierge Smithy was the friendliest and most helpful I have ever met. As previous stays in this hotel, the room was excellent and the staff extremely helpful. I would recommend this hotel and parking, as being of a great standard and good value. V nice hotel with great location for Heathrow. Documentation received was not clear if breakfast was included. Apart from this, no problems experienced. Good room provided. Perfect location for us and nice hotel, ticked all the boxes - there was some confusion with the hopper bus to the airport but the driver kindly let us on the bus so all was good. Large hotel with lots of parking. Car is left where you park it and you don't leave your keys. Comfortable rooms. Hoppa service was not available but taxi was. Cost Â£24 pounds for four of us with luggage to get to airport and only Â£17 to get from airport to hotel on our return using a taxi from the rank outside the airport. We parked before and stayed the night we returned from holiday. Parked up gave reception our reg no and went on holiday, returned after a long late flight check in went smoothly receptionist extremely friendly, room clean and comfortable, hotel breakfast great value / choice . This hotel is less than 5 mins from the airport, parking easy and you keep your keys. Would highly recommend. From the M4: Take exit 4 for Heathrow terminals 1,2, and 3, go up Spur road towards Heathrow airport. Turn left at the Central London/A4 sign and left again into the hotel which will now be in front of you. From M25: Follow signs for M4 Heathrow terminals one, two and three. Take exit 4 from M4 for Heathrow terminals 1,2 and 3, go up Spur road towards Heathrow Airport.urn left at the Central London/A4 sign and left again into the hotel which will now be in front of you. By Public Transport: Take Piccadilly line tube or Heathrow Express and alight at terminals 1,2, and 3. Transfers via the Hotel Hoppa are charged at £5 single (£9 return) per adult. Children under 15 travel free (subject to change) if you buy them from the driver. The Hoppa doesn't run to T4 from this hotel. You will need to take the Hoppa to T2 and from there catch the free Heathrow Express to T4. Free shuttle trains run between Heathrow Central station Terminals 2 & 3 and Terminal 4, There are four trains an hour. The 'Hoppa bus' is a service run by a third party operator (National Express) and does not form part of the package purchased and any other information, not part of the package is subject to change without notice. Central London is easily accessible by the London Underground stations and the Heathrow Express. View all Heathrow Airport Hotel options available from FHR.